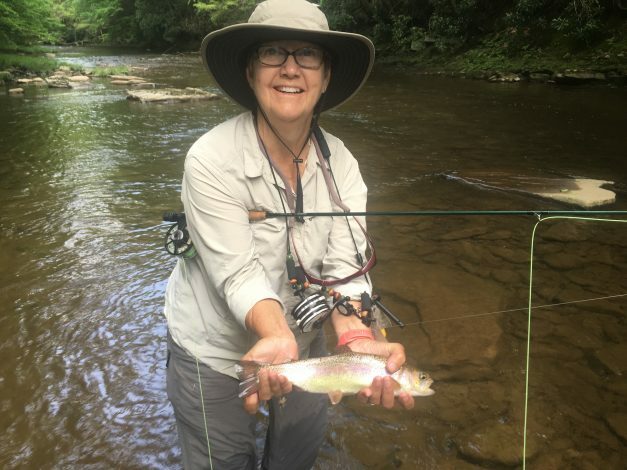 If there is a river you should go and fish as a beginner to fly fishing, I’d highly recommend the Cumberland River, one of the TU Top 100 Trout Streams. Furthermore, the guide you want is Troy Humphrey of Cumberland Trout Guide. Troy had us on fish from the start, including a double (both Barb and I hooking up and landing fish at the same time) on our first drift. We also caught all three species of trout in the Cumberland… browns, brookies and rainbows. Why the Cumberland? It gives you a really good chance of catching a lot of fish so you can practice casting, mending, setting the hook and landing fish. Often times you don’t get to practice all of these like you do on the Cumberland. Why Troy? He talks a lot about his guide philosophy of safety, fun and fish… in that order. Anytime you get in a boat you want to have safety as a number one priority. Close behind that, at least for “Berb” and I is fun. We had a blast with Troy… Barb became “Berb” during the day. You’ll have to fish with Troy to find out why…. all i can say is, he does have a great sense of humor. Finally, yes, of course, fishing! We quit counting the number of fish we were catching about 15 minutes into our full day trip. It was evident we were going to be on fish a lot, be able to practice our skills, and hopefully hook into a big lunker along the way. Troy delivered on his “trifecta” with us. For now, please enjoy this interview with “Streamer Troy” to learn more about this great fishery. 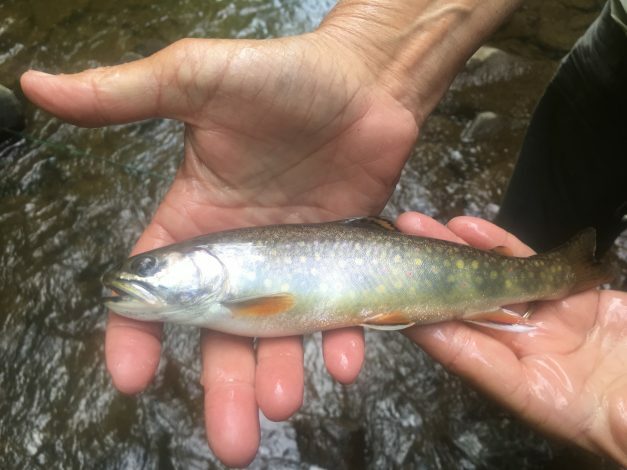 Driving from our campground at Deep Creek Lake State Park to the fly shop at Savage River Outfitters takes you down along one of the many brook trout streams in the Savage River Watershed, Crabtree Creek. Barb and I are brook trout junkies for sure. So, of course we pulled off the road to cast our small, light rods for beautiful brookies. What we didn’t realize was what was in store for us when we made it to the Savage River, more specifically, the “lower” Savage below the dam. Being a “technical” stream to fish, we knew we needed help and called the guys at SRO, Mike Evans and Charlie Laffey. To say that they took care of us would be an understatement. Mike sent us out to fish more brook trout streams in the watershed first before our guide trip with Charlie and him. We had a great day fishing for the wild brown trout that inhabit this beautiful stream. We wish we had more time to fish the Savage and its tributaries. However, we know we’ll be coming back and stopping at SRO for guidance and great hospitality. 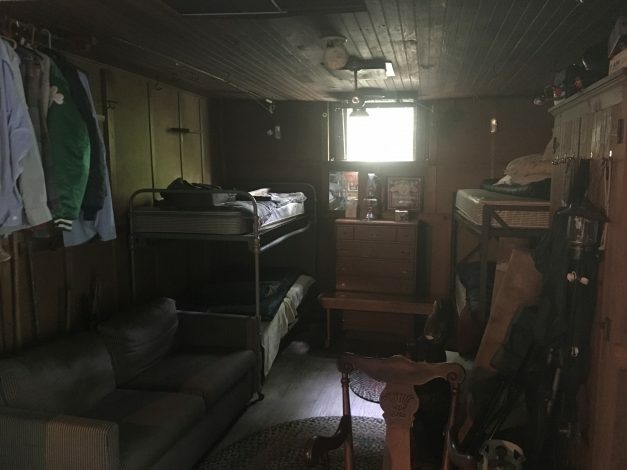 They have cabins that are really nice and set right on a gorgeous and productive section of the Savage River. Get there and enjoy some great dry/dropper fishing. For now, please take a few minutes to learn more about this amazing fishery from Mike Evans. 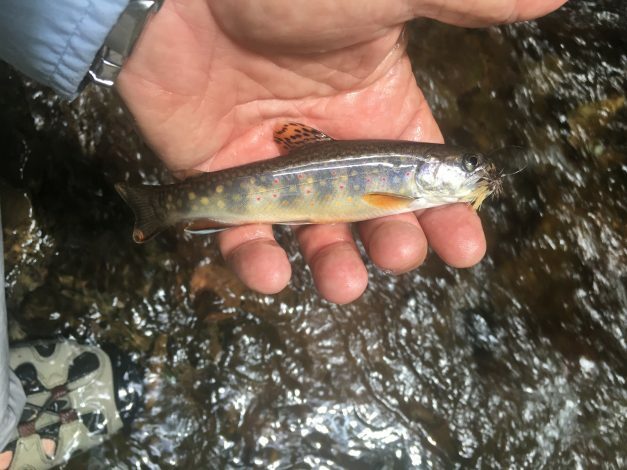 When we saw that the North Branch of the Potomac was on the list of the TU Top 100 Trout Streams, the context we had for it was based on our time in Washington DC. That part of the Potomac really didn’t seem to be fishable for trout. We were so surprised when we reached the banks of the North Branch at Barnum WV. A beautiful trout stream was flowing before us. We jumped into a small fishing raft with Harold Harsh, owner of Spring Creek Outfitters. Harold has been fishing these waters for decades. He took us down the river and put us on some really nice fish. Barb was slaying them all day. Harold knows this river incredibly well and you will too when you fish the Harold Harsh (HH) Potomac as we did. For now, enjoy this interview with Harold as he discusses the ins and outs of fishing the NB. Today we are celebrating our 100th day on our adventure fishing the Trout Unlimited Top 100 Trout Streams. The SaraLinda has traveled 3513 miles thus far. We have fished 26 of the Top 100 streams and have fished 44 streams total. 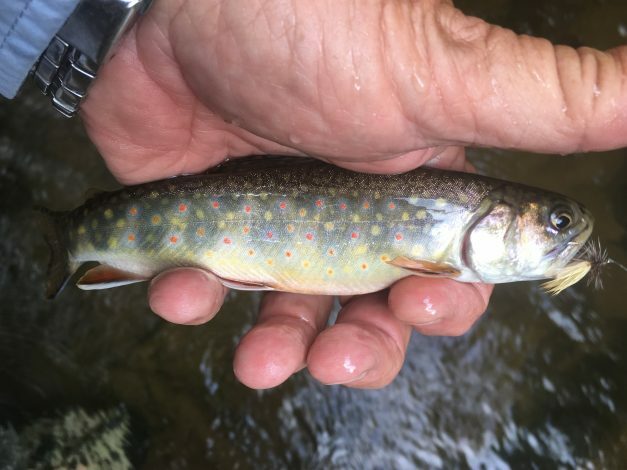 The gallery above is a sampling of the beautiful fish we caught today fishing the Savage River, Middle Fork and Crabapple Run in far Western Maryland. What we found early on was that Its Not About the Fish, but its about the people we are meeting. That is still true today. From all of our guides (check out their interviews), to the fly shop owners, the musicians sharing their music with us, the campground hosts who’ve helped us out tremendously and all the people in the local diners, coffee shops and breweries we’ve visited. Its really been a blessing meeting and becoming friends with them all. We are in Maryland for another few days before heading to Kentucky to fish the Cumberland. After that, we’re headed to Carmel, IN to see the grandkids over the 4th of July before continuing our adventure in Michigan. We hope you are enjoying tagging along with us on our ramble. If you have any questions or even better, have any suggestions for things to do in the areas we’re visiting, please please send them along!!! We’ve been blessed this entire trip in meeting and being befriended by so many people…. 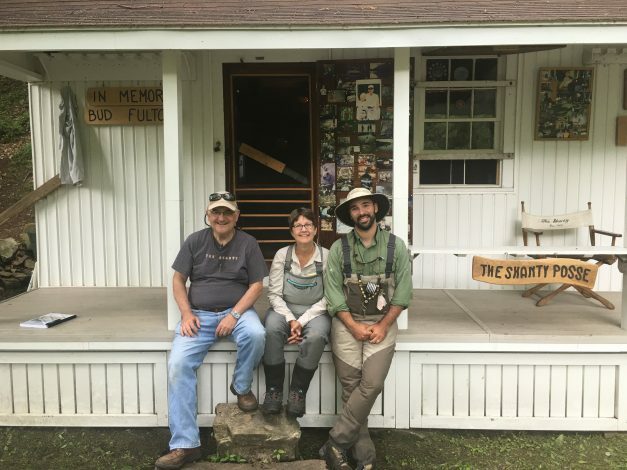 From Jimmy and Kathy Harris and Ron Thomas in Helen, GA to Tom and Deb Finkbiner in Slate Run, PA… to all our guides we’ve enjoyed and who’ve taught us so much about fishing and the incredible places where their local trout live… to the musicians who’ve shared their songs and stories with us… all of the fly shops and their staffs who’ve put us on the flies and fishing spots for fun and successful fishing. While you might think our journey is about fishing the TU Top 100 Trout Streams, it really isn’t. As Andy Wagner, our guide on Spruce and Penns Creek says, “fishing is just an excuse”… an excuse to get together with old friends, make new friends, break bread together and be a part of a community of people who share your same “excuse”. This has been our biggest “aha” moment of the trip and it was really brought home when Andy took us on a side trip at Penns Creek. There are many fishing, hunting and “sportsmen’s” camps dotted along the streams we’ve fished in Pennsylvania. After we’d spent the morning on Penns Creek, Andy took us to one of these camps which is known as “The Shanty”. Imagine a small, one room cottage with no electricity, no running water, no phone and the nearest road is at least 1/4 mile away. 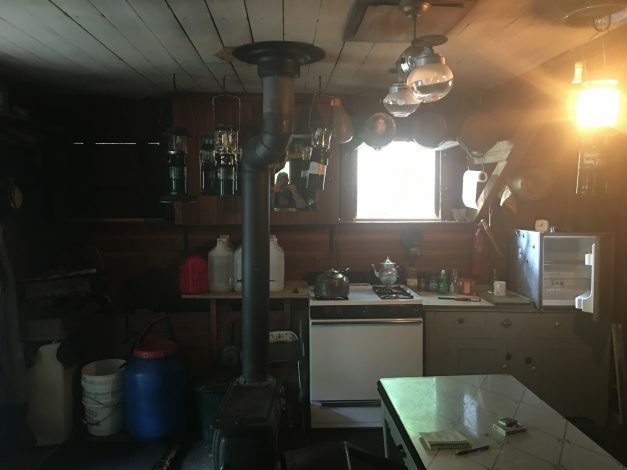 Inside is a wood stove, a sink, two sets of bunk beds, a sofa, a few chairs, a propane stove, a kitchen table, several kerosene lamps, some books and other items. Food, supplies, water (beer), propane, wood, etc… all have to be brought in via lawn cart along a path left by the railroads that runs along Penns Creek. That is the “physical” characteristics of “The Shanty”. But kind of like “its not about the fish”, its really not about the physical characteristics of this camp. Its about the people who built it and the people who now occupy and care for it and its history. Thanks to Andy, we were honored to have met one of those people, Jeff Zim, a retired teacher and school principal. Jeff shared the history of The Shanty from when it was originally built to its current set of characters who inhabit it. 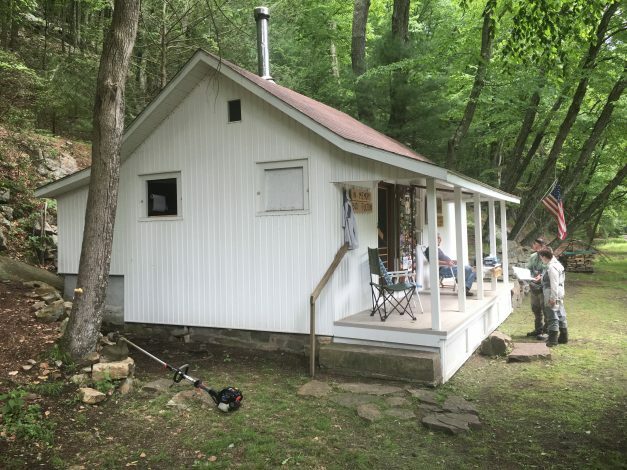 The real history of the camp is in the hearts and minds of the people who’ve been fortunate enough to have stayed there, shared a drink and a cigar on the porch and fished with Jeff and the “Shanty Posse”. It’s in the stories experienced and shared. Barb and I were privileged to have spent a while sitting with Jeff and hearing some of those stories. Most of them didn’t involve fishing at all, but the characters who share our community “excuse” of fly fishing. Many of Jeff’s stories included one of his primary “posse” members, Bob Ranck. We laughed so hard at some of the stories centered around “Ranck”. What seemed to emerge from all the stories was that Bob got it more than the rest of us, meaning he really knew and lived the saying “it’s not about the fish”. From all the stories it was clear, “Ranck” was a character. I wish we’d have had a chance to meet him as well and he could have been there to share his side of the stories being told. They were priceless! Places like this, and more importantly, people like this are so very special. Barb and I want to thank Andy for bringing us up to The Shanty and introducing us to Jeff. HUGE thank you to Jeff for opening his heart and his stories to us. It meant the world to us both. And even though he wasn’t there in person, he seemed to be there with us in spirit… a special thank you to Bob Ranck for creating this incredible place and keeping a warm and welcoming front porch for passers by to become friends. In Part 3 of our interview with Lance Wilt and JD Vera of Outcast Anglers, we talk about tips to make your guide experience click. Both Lance and JD offer some pearls of wisdom to help you be successful and happy with your guide trip. Enjoy! In Part 2 of our interview with Lance Wilt and JD Vera of Outcast Anglers, they discuss what makes all the rivers in the State College area so special. They also discuss the bugs you’ll see on the river as well as how to fish each. They share great knowledge on how to have a successful fishing experience. Watch, learn and enjoy! We had the pleasure of fishing with the founder and owner of Outcast Anglers, Lance Wilt along with JD Vera who is working with Lance this spring. JD runs a guiding operation in the Central Patagonia region of Chile. We fished three different “creeks” in the State College PA area with them: Spring Creek, Fishing Creek and Penns Creek. We had a blast and caught fish each day, including a few big ones! Please enjoy Part 1 of their interview in which you learn about how they got into fly fishing in the first place. Both are very interesting stories… one from a very local perspective and one that spans from Patagonia to Minnesota. Stay tuned for Parts 2 and 3 coming soon! There were no guides to be had for Kettle Creek so we went to the local fly shop, Kettle Creek Tackle Shop, for help in picking flies and spots to fish. We never know quite what to expect when we go in “blind” to a fly shop with our story of fishing the TU Top 100 Trout Streams. Most warm up pretty quickly to help us out (we must look desperate) but sometimes it takes a visit or two, which was the case here. However, once we got to know the shop and its staff, they were awesome in getting us onto the right flies. As for spots to fish, we kind of stumbled onto them. However, what a stumble we had! We caught fish each day on dry flies in numerous spots. We even got to fish a couple of tributaries including the Cross Fork which brought us some beautiful brook trout. Barb and I both love fishing small streams for wild brook trout. The area along Kettle Creek was just gorgeous. We stayed in Kettle Creek State Park in the SaraLinda. Had a couple of great meals (and beers) at Deb’s Cross Fork Inn in the little town of Cross Fork. And visited the Ole Bull State Park several times for picnics and “rest stops”. Ole is actually a man’s name and is pronounced “Oly” like the beer. There were several creative fishing camps along the road like the “Oly Cow Camp” and one titled “Oly S#%t”. Fly fishing people have a unique sense of humor. We hope you enjoy this short music video chronicling our time along Kettle Creek.